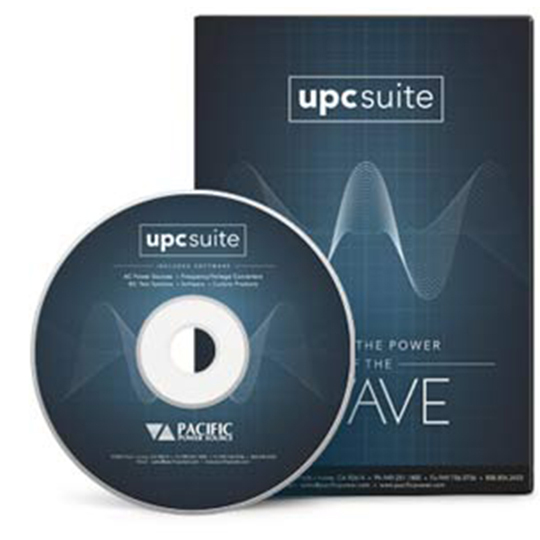 Pacific Power Source’s new UPC Studio software allows Control of your UPC equipped Pacific AC Power Source. 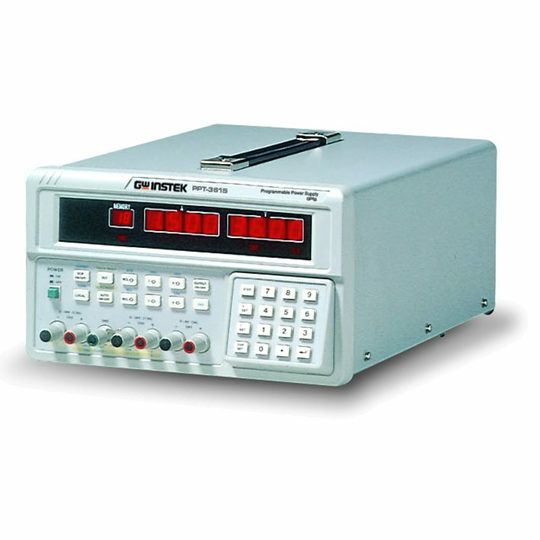 Operated from your PC’s GPIB or RS-232 interface, all areas of control and measurement are presented in a greatly enhanced, easy to use, graphical interface. 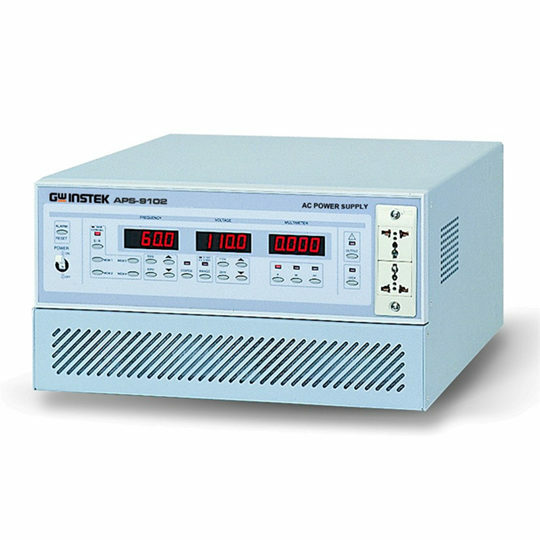 The UPC Control Panel provides quick and easy operation of your AC Power Source. UPC Studio will automatically determine your AC Power Source’s configuration and offer the appropriate options installed on your AC Power Source. 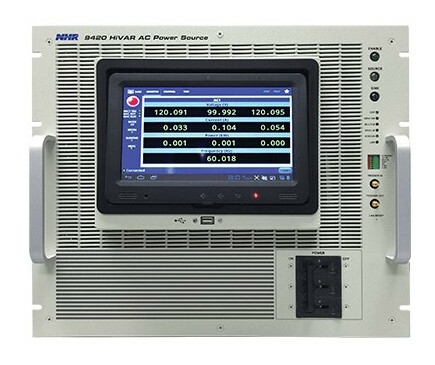 Selecting the Metering Screen will display measured output values or the Voltage/Current output waveforms. 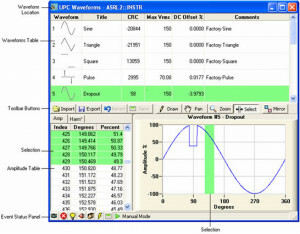 If your AC Power Source is equipped with the Harmonics Analysis and Synthesis (HAS) option, then the measured harmonics may be displayed in graphical or numerical form. 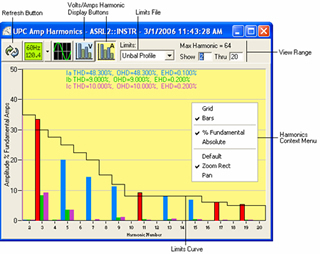 Harmonic limit values can be applied to the graph to compare the measured values against pre-determined requirements. The limit values are maintained in a CSV type file. Measured values which exceed limit values are shown in red. UPC Studio’s Waveform Editor allows you to view all waveforms stored in your UPC. 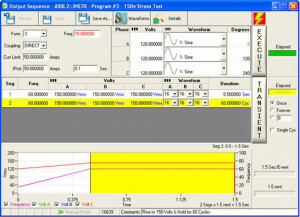 With the Waveform Editor almost any waveform may be produced using tools like Freehand draw, Harmonic and Phase angle values, Ring Waveform wizard, and a wide range of import features. The title bar of the waveform editor window shows the location of the waveforms contained in the window. In the example below, these waveforms are currently loaded into your UPC. The waveform editor allows you to import, export, edit, print, or create arbitrary waveforms. Note that waveform 1 (Sine) is reserved meaning the contents cannot be changed, however you can edit the Title and Comments for waveform 1. The Output Sequencer allows you to link waveforms to your UPC Programs. When an Output Sequence is executed UPC Studio quickly compares the waveforms used by the Sequence with those stored on the UPC. 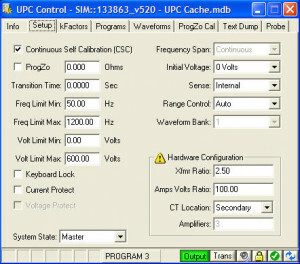 If needed UPC Studio will load any waveforms used by the Output Sequence into UPC Memory prior to executing. 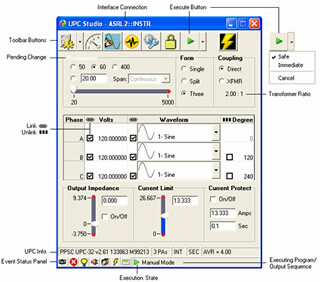 Transient creation has been simplified by allowing you to program Transient Segments as a percentage of the Steady State voltage or with a duration defined in cycles or seconds. The Transient Graph shows a graphical representation of the transient segments. Clicking in the graph highlights that segment. The graph shows the values as they transition from one segment to the next starting with the steady state values. 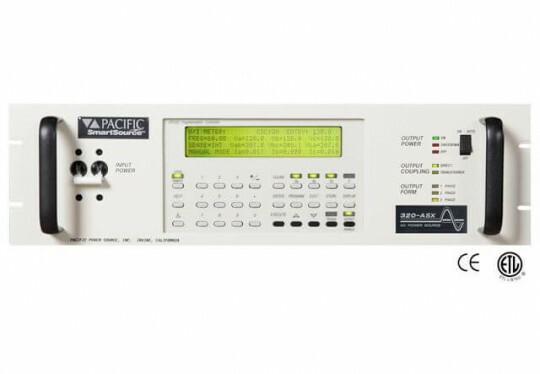 UPC Studio’s “UPC Control” soft panel provides a simple and effective means by which to test UPC remote communications as well as save and restore all set-up, calibration, programs and waveforms. Backwards compatible to pre version 5.x firmware, UPC Control is provided at no charge with every Pacific Power Source unit.